Join us for our 39th Annual Trade Show at Disney’s Coronado Springs Resort in Orlando, Florida! Oct 7, 8:00 a.m. – 10:00 p.m.
Oct 8, 8:00 a.m. – 12:30 p.m.
Oct 8, 12:30 p.m. – 6:30 p.m.
Oct 9, 11:00 a.m. – 3:30 p.m.
Meet waterpark and resort owners and developers at the WWA’s 39th Annual Trade Show at Disney’s Coronado Springs Resort in Orlando, Florida, October 8 – 9, 2019. Exhibiting has never been easier—and we work hard to create a friendly, relaxed and organized atmosphere. We take great care of our exhibitors by providing a daily buffet lunches and entry to parties/receptions for two members of your staff. Each 10’ by 10’ booth is $1,595 with a 50% deposit requested at the time of initial reservation. No educational sessions compete with the hours for this two-day trade show! Exhibitors will be provided with a complete post-show attendance list for follow-up after the show. Each 10′ x10′ booth fee includes registration for two of your staff members. Feel free to contact Patty Miller with any questions you may have about the WWA, our trade show or the waterpark industry! Patty can be reached at 1-913-381-6734 (phone), 1-913-381-6722 (fax) or patty@waterparks.org. For this years exhibiting information, click here! Become a WWA Supplier Member! 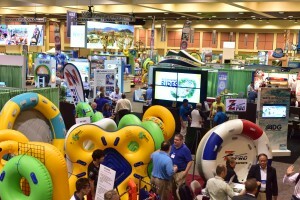 Membership to the World Waterpark Association offers tremendous benefits, and is a great way to expose your company into this booming industry. Click here to review member benefits and to join the WWA.